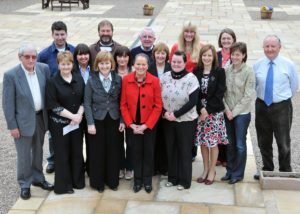 You are here: Home — Groups from Desertmartin, Tobermore, Kilcronaghan and Draperstown receive community grants. Following the success of the first round of awards of its Community Fund, Draperstown-based Workspace has awarded a further 14 grants totaling £6,250 to local voluntary and community groups. The Fund invites local voluntary and community groups to apply for grants through the Community Foundation for Northern Ireland. The initial round of applications saw fourteen local groups being awarded grants at a presentation evening in November 2009. A second call for applications was made and a further 14 local voluntary and community groups have been successful, ranging from Ballinascreen Camogie Club seeking assistance to purchase keep fit equipment to Draperstown Early Years seeking support for their fine motor skills project for children with special needs were. A third call for applications is now open and will close on 16th June 2010. Community groups and organisations in the Ballinascreen, Kilcronaghan, Tobermore and Desertmartin areas are encouraged to apply. Details of the fund and applications can be found on the Workspace website at www.workspace.org.uk or can be obtained from the Community Foundation for Northern Ireland.